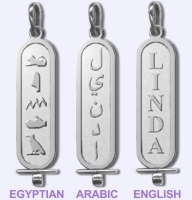 The Personalised handmade Cartouches with your name in Egyptian Hieroglyph, Arabic, or English comes in 5 different sizes. The pictures shown here and the sketch with the requested names that will be sent for approval are all designed on Computer but the original Cartouche will be completely handmade so, kindly do not expect letters / hieroglyphs to be exactly same as the sketch. Please check the size before ordering.